Bed and Breakfasts near Edinburgh Airport for 1 night from Sun Apr 21, 2019 to Mon Apr 22, 2019 within 25 miles, in an Average Nightly price range of £1 to £200. 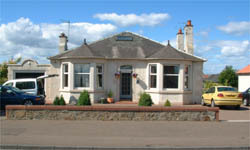 Almond House is situated in Edinburgh, a 10-minute drive from the airport. It offers free Wi-Fi and free parking on site, and an airport shuttle bus passes the door every 10 minutes. Murrayfield Stadium is a mile away, and Edinburgh Zoo, with its monkeys, bears and penguins, can be reached in just 5 minutes by car. The city centre is a 20-minute bus ride away. Each room at Almond House B&B has traditional wooden furnishing and a TV for guests to enjoy. Rooms also have an en suite bathroom with free toiletries. A full cooked breakfast is served in the bright eating area each morning. There is also a garden to relax in, surrounded by colourful potted flowers. Almond House is a 5-minute walk from a selection of shops, restaurants and supermarkets. A charming stone-built Victorian villa dating back to the 1880s, Corstorphine Lodge Hotel is located on the A8, which links Edinburgh Airport to the city centre. Guests can enjoy free WiFi in all rooms. There is a bus service running to the city centre approximately every 5 minutes and to the Airport every 15 minutes. Guests can enjoy the beautifully landscaped Victorian walled gardens. A full continental, vegetarian or traditional cooked Scottish breakfast is served in the large conservatory. Each room at Corstorphine Lodge is tastefully decorated, with original cornices and architectural features. Rooms have a large LCD TV with over 50 channels, and a drinks tray with tea, coffee and biscuits to enjoy. Most have views of the gardens and the Pentlands Hills. Edinburgh Zoo, Edinburgh Business Park, The Gyle Indoor Shopping Centre and Murrayfield Rugby Stadium are all within 5 minutes' drive from the hotel. Free private parking is provided at Innkeeper's Lodge Edinburgh, which is located just 10 minutes' walk from Edinburgh Zoo. A traditional British menu featuring seasonal vegetables is available in the Toby Carvery restaurant, in which guests can also enjoy a continental buffet breakfast. The airport bus stops within 200 metres of Innkeeper's Lodge Edinburgh, Corstorphine and travels to Edinburgh Airport within 20 minutes. Haymarket Rail Station is just a 5-minute taxi journey away and Edinburgh International Conference Centre can be reached after 10 minutes' drive. Each bright room has a TV and tea and coffee making facilities. Free toiletries and a hairdryer are provided in the en suite bathroom. The Bridge Inn in Ratho features 4-star accommodation with a garden. Boasting a shared lounge, this property also has a restaurant and a terrace. Free WiFi is offered. The units in the inn are fitted with a flat-screen TV. The private bathroom is equipped with free toiletries. All guest rooms feature a wardrobe. A continental breakfast is served each morning at the property. Edinburgh is 15 km from The Bridge Inn. The nearest airport is Edinburgh Airport, 5 km from the property. This hotel is next to Edinburgh Zoo, close to Murrayfield Stadium and 4 miles from Edinburgh International Airport. It offers a pool, gym, free parking and a restaurant. Each room at this Holiday Inn is spacious, with tea and coffee facilities and satellite TV. Every room also has air conditioning and free WiFi. The hotel's Spirit Health and Fitness Club has a sauna, spa, solarium, and offers beauty treatments. There is an international restaurant, as well as a cocktail lounge. Start the day with a buffet breakfast including a selection of continental and cooked items. Holiday Inn Edinburgh is 3 miles west of the city centre and has a view of the Pentland Hills. Edinburgh Castle and the city centre are easy to access by bus, with stops less than 5 minutes' walk away. Few hotels in and around Edinburgh can match this lodge for its views or place in literary history. Many of its 14 cosy rooms look out over the iconic Forth Road Bridge and the Firth of the Forth estuary and it s said that legendary author Robert Louis Stevenson wrote part of his famous novel Kidnapped here there s even a mention of The Hawes Inn in the book. Just 10 miles from the city centre the South Queensferry lodge is an ideal base for visiting Scotland s historic capital where you can explore Edinburgh Castle the shops of the Royal Mile or the city s many museums and restaurants. Also perfect for golfers it s within striking distance of Carnoustie and St Andrew s and close to the birthplace of golf at the East Neuk of Fife. The Tudor Gothic Dalmeny House and Georgian Hopetoun House are also well worth a visit. Overlooking the Firth of Forth railway bridge, Innkeeper's Lodge Edinburgh, South Queensferry, is just 20 minutes' drive from the historical city centre of Edinburgh. 2 golf courses are situated within 5 miles of the accommodation. Many rooms at Innkeeper's Lodge Edinburgh overlook the river and iconic Forth Road Bridge, and each has a flat-screen TV, en-suite bathroom and tea/coffee making facilities. A log fire and beer garden are featured in the Hawes Inn country pub and restaurant, which is attached to the lodge. Dishes such as braised pork belly and cheese-topped fish pies are served in the restaurant. Real ales are on offer at the bar, and continental buffet breakfasts are provided in the morning. Deep Sea World aquarium is only 15 minutes by car, and Bedlam Paintball Edinburgh is just 2.3 miles away. Twin Lions Hotel is the ideal place to base your stay in Edinburgh. From the warm welcome you receive to the comfortable and cosy bedrooms and cooked Scottish breakfasts we ensure you will have a great stay. Our rooms are not over sized however our tidy and cosy rooms provide you with everything you need and is a haven for rest and recoupe after a bustling day of fun and all that beautiful Edinburgh has to offer day and night. br / br / br / br / The location of the hotel could not be better - a stone s throw from the famous Murrayfield Rugby Stadium at the foot of Corstorphine hill where you can take walks that will give you an unimpeded view over the whole city including Edinburgh Castle Scotland s top tourist attraction - to the Pentland Hills beyond. br / br / br / br / The bus stop is right outside of our door which takes about 5 minutes to take you right to the shops and Gardens of Princes Street Edinburgh Castle The Scottish National Gallery The Gallery of Modern Art Murrayfield Hospital Edinburgh International Conference Centre and Edinburgh Zoo. br / br / br / br / The Haymarket Station is located a few minutes walk from the hotel and Waverley Railway Station is 10 minutes on the bus or a short taxi ride away. Both provide excellent travel links to the rest of the country. In addition Edinburgh International Airport is only a 15 minute drive and easily accessible by taxi Airbus and tram. br / br / br / br / If you are visiting the vibrant city of Edinburgh for a special occasion such as an Anniversary Honeymoon Special Birthday Hen or Stag Night or even for a Business Party the Twin Lions Hotel will cater to all your needs in our Caledonia Lounge. br / br / br / br / Last but not the least we have free WIFI throughout the premises and private parking for our guests. Twin Lions Hotel is the ideal place to base your stay in Edinburgh. From the warm welcome you receive to the comfortable and cosy bedrooms and cooked Scottish breakfasts we ensure you will have a great stay. Offering a restaurant and a bar, Twin Lions Hotel also has free WiFi access and free on-site parking. Located in city of Edinburgh, the property is 4 minutes' drive from Murrayfield Rugby Stadium and a minute's drive from Edinburgh Zoo. Inside each room there is a flat-screen TV and an electric kettle. Featuring a bath or shower, the private bathroom also comes with a hairdryer and free toiletries. At Twin Lions Hotel there is a 24-hour front desk and a garden. Other facilities offered at the property include meeting facilities, a shared lounge and a tour desk. An array of activities can be enjoyed on site or in the surroundings, including golfing. The hotel is 1.4 miles from Haymarket Train Station and 11 minutes' drive from the iconic Edinburgh Castle and The Scotch Whisky Experience.